The OPC is saddened to hear news that longtime OPC member Rachel Bail passed away peacefully the evening of Sunday, Aug. 27 with her family. In New York, she met and later married concert violinist Herbert Baumel and the couple moved to Caracas, Venezuela and then Rome, Italy where her society column in the Rome Daily American “Lend Me Your Ears,” covered the golden age of Cinecitta in the Eternal City. Following the birth of the couple’s first daughter, Susan Benay Baumel, the couple returned to New York City where two more children, Samuel Baumel and Mary Elizabeth Baumel were born. 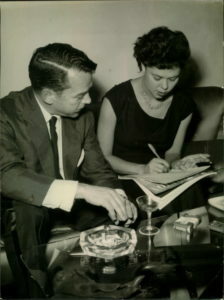 Bail authored the book Alec Templeton’s Music Boxes, and continued to pursue her passion for journalism as a member of the National Press Club and Overseas Press Club. 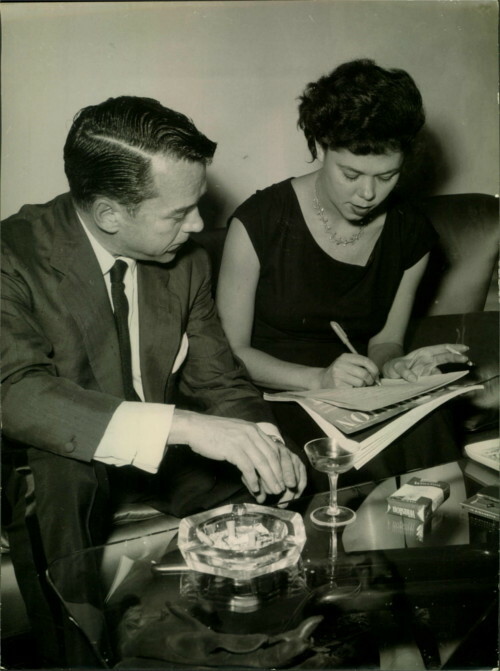 She and Herbert were also active in the theater scene; Herbert worked as Harold Prince’s concertmaster on Broadway, and the couple counted Leonard Bernstein, Hal Hastings, Sheldon Harnick and Judge Benjamin Altman amongst their friends. Following divorce she worked as a staff reporter and editor for Gannett (White Plains, NY), the Florida Times Union (Jacksonville, FL), and the St. Petersburg Times (St. Petersburg, FL) before moving to Washington, D.C. in 1975 where she had a long career as writer, Supreme Court correspondent and editor at Voice of America. She interviewed such luminaries as Nelson Mandela, the Dalai Lama, Sir Laurence Olivier, Fidel Castro, Estee Lauder, Robert Redford and Peter Ustinov amongst others. As a champion of women’s rights, Rachael promoted the work of women in the arts. She was a playwright herself, a member of the Dramatists Guild and professed the belief that “the theatre must be a vital conversation with society,” which lead to her role in founding the McLean Drama Company. She authored over twenty original plays including, “Emily and I”, “Immoral Combat”, “Return to Vietnam” and “Florida Days” amongst others. She is survived by Susan and Samuel Baumel and grandchildren Ely Baumel-Lamonica, Elizabeth Baumel and Jessica Baumel. Bail’s funeral service will be at her parents’ church, the Church of the Brethren in Arcadia, Florida. A memorial service is planned by MDC at the National Press Club Washington, D.C. on a date to be announced later. Friends and family request that any donations, in lieu of flowers, are contributed to the McLean Drama Company, a 501(c)3, to continue her vision of presenting original works (Bail/MDC: 520 12th Street South, #303, Arlington, VA, 22202) or to the Arcadia Church of the Brethren (25 Mills Avenue, Arcadia, FL, 34266-4616).